This magnificent 101 foot waterfall, located in Devils Postpile National Monument, treats visitors to colorful rainbows in the falls mist. Access Rainbow Falls by taking the mandatory Reds Meadow Shuttle Bus departing from Mammoth Mountain Ski Area. Rainbow Falls is over 100 feet tall. 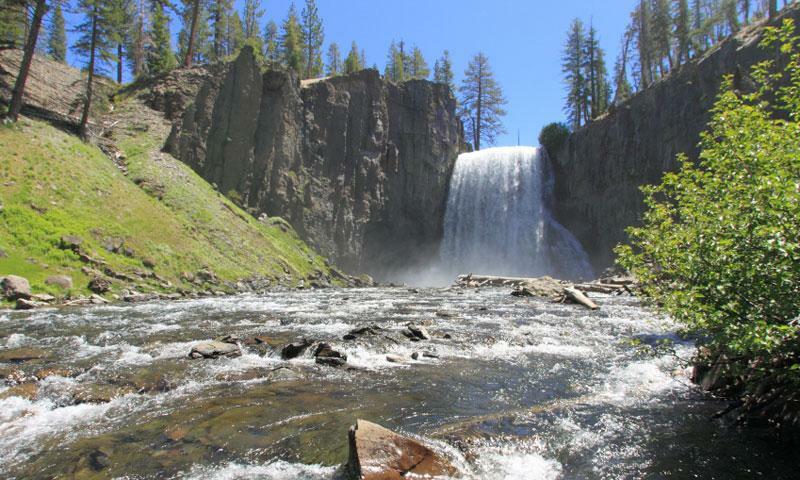 After viewing the falls, spend the day exploring Devils Postpile National Monument. This impressive 101 foot waterfall, located in the Devils Postpile National Monument is accessible via a moderate hike. Most visitors will take the mandatory Reds Meadow Shuttle Bus, departing from the Mammoth Mountain Ski Area parking lot (from US 395 head west on SR 203 to Mammoth Lakes). Shuttle service begins in mid-June and continues through the end of September. Tickets cost $7.00 for adults, $4.00 for children over the age of 3, and children under the age of 3 ride free. Purchase tickets at the Mammoth Mountain Adventure Center or any other Mammoth Mountain Ticket Outlet. When staying overnight at Reds Meadow Resort or in the designated campground. The Falls is accessible when the Monument is open. The Monument operates seasonally, typically from mid-June through mid-October. During operating season it is open 24 hours a day, 7 days a week. The Ranger Station is open from 9:00am to 5:00 pm daily. After taking the shuttle bus into Devils Postpile, access the falls trailhead by the ranger station. Shuttle Bus 9 will transport you back. There are numerous other activities available in the Devils Postpile National Monument.